So today I am headed to Los Angeles for the release of my Route 66 book “Get Your Kicks”. If you somehow missed it I traveled all of Route 66 from Chicago to LA with a bunch of hot naked girls taking photos of them and roadside Americana and them in front of roadside Americana. I am doing a big photo show and book release party at Mishka LA this Friday. There will be another smaller event at Mishka’s Brooklyn location on Oct 17th. If you want to know more you could read my original post, or check out write ups on Animal New York, AVN.com, and Fleshbot. 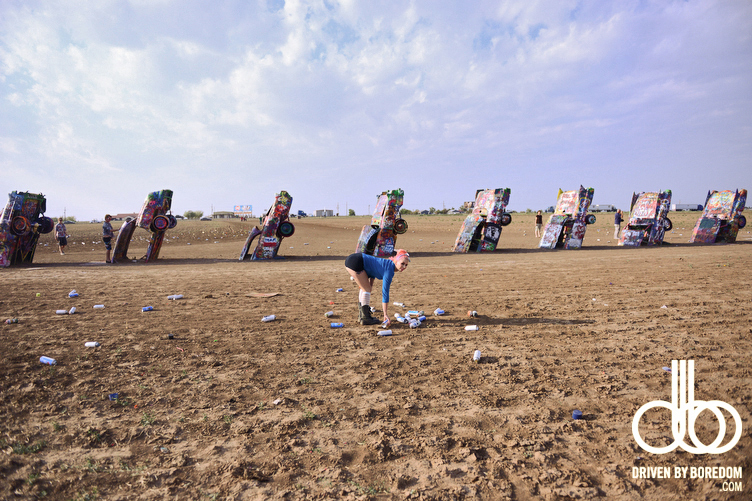 In honor of the book release I am going to post this set of Annalee Belle at the famous Cadillac Ranch in Amarillo, TX. The Ranch is a Route 66 classic built by the eccentric oil billionaire/ artist Stanley Marsh 3. It was one of the main attractions I really HAD to see on my road trip and I wanted to shoot a naked girl in front of it. Unfortunately I didn’t have a model for that leg of the trip so I went to the internet to find someone. I only managed to find two possible models in Amarillo and I emailed them both. Annalee Belle hit me up and not only was down for the shoot but was actually a fan of my work. I was pretty psyched. I picked her up and we headed to the ranch and she kinda ruined my excitement when she told me Stanley Marsh was a child molester and was currently on trial for sexually assaulting several teen boys. Despite this awful news we headed to the Cadillac Ranch and despite insane winds, dust and tons of people spray painting the Cadillacs we managed to shoot a few photos including the cover of my book! On top of that we only got caught like twice and I had Annalee home in less than an hour from when I picked her up. It was a pretty successful trip. But yeah, check out these photos and get excited for the release of my first of what will hopefully be many books. Click here to see Annalee Belle naked in public at the famous Cadillac Ranch near Route 66 in Amarillo, TX!